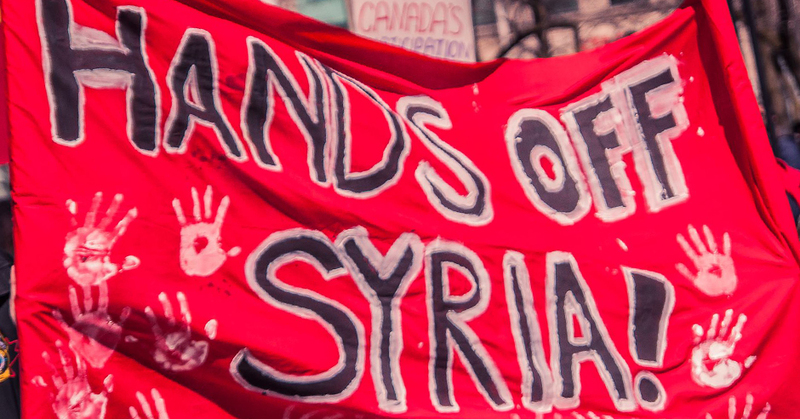 The Communist Party of Canada condemns the illegal and murderous airstrikes on Syria conducted by the US, UK and France April 13th, and the support given to these attacks by Prime Minister Justin Trudeau. We call on Parliament to condemn the airstrikes which are illegal under international law, under US law and under UK law, and under the UN Charter that rules these are war crimes. The strikes take place one day before the United Nations Organization for the Prevention of Chemical Weapons (OPCW) was to visit Douma, Syria to examine the site where the US and its allies claim chemical weapons were used against Syrian civilians. The OPCW was going to Syria April 14 over the objections of the US government which had earlier vetoed a Russian motion to send the OPCW to investigate and determine whether chemical weapons were used, or not. Following the US veto, the Syrian government invited the OPCW to investigate, which it had agreed to do. The OPCW arrived in Syria April 14 to carry out the investigation in Douma, despite the airstrikes just hours before. Contrary to US claims, no evidence has been produced to prove that chemical weapons were used, or found, in Douma. Senior US officials including US Secretary of Defence James Mattis on April 12 – one day before the airstrikes – have admitted that there is no evidence of a chemical weapons attack in Douma. Yet President Trump has launched airstrikes with the support of British PM Theresa May and French President Macron, but not their governments or Parliaments, after tweeting his war plans to the world. The strikes are reminiscent of last year’s attacks, which were also based on falsified information and also sold to the public under the rubric of the US’ and EU’s “responsibility to protect”. In fact this doctrine and these acts of war are protecting the mega-profits of the corporations and the arms industries. This doctrine of war is responsible for the deaths of 2 million people since it first appeared in the region in 2001. The Canadian government’s support for this doctrine has transformed Canada into an active participant in US and NATO’s dirty wars and aggression around the world, and has saddled the Canadian public with a 70% increase in military spending, plus increased spending on NATO, shredding Trudeau’s promise to transform Canadian foreign policy from war-making to peace-keeping. Canada is in lock-step with US imperialism and the world’s war mongers, ready and willing to overthrow governments it does not like, and the UN Charter that rules these are war crimes. The infamous fable of Iraqi ‘weapons of mass destruction’ which was the justification for the illegal US war on Iraq has long since been exposed as a fabrication of the US government. Similarly, the US statement that sarin gas was used by the Syrian government was also proven to be baseless, though it was also stated as fact in the western press and media. These are the Big Lies created by the US government to justify US and NATO aggression and war on countries around the world. All of the evidence points to the fact that the April 13 airstrikes on Syria were deliberately aimed to prevent peace and to escalate the danger of a conventional or nuclear conflict between the US and Russia, now that the Syrian government assisted by Russia, has won the war and defeated the US backed insurgent forces of ISIS, the al-Nusra Front, the Army of Islam, and other extremists and terrorists opposed to the Syrian government of Bashar al-Assad. The US refusal to accept the military defeat and the transition to peace about to be negotiated according to international law and involving the Syrian government, the US, Russia, and others, is the real reason for the airstrikes April 13. This is consistent with the unmistakable evidence of the drive to war being pressed in the weeks leading up to April 13, in the US press and media, and in social media. This campaign of lies and disinformation was echoed in media across the capitalist world resulting in mass confusion about the real situation in Syria, and those actually responsible. Canadians have been fooled before. They shouldn’t be fooled again. The US/UK/French attacks have nothing to do with protection of the Syrian people, and everything to do with the drive for profits and the overthrow of governments that will not bend to US dictates. These airstrikes threaten not only Syria, but global peace and stability. 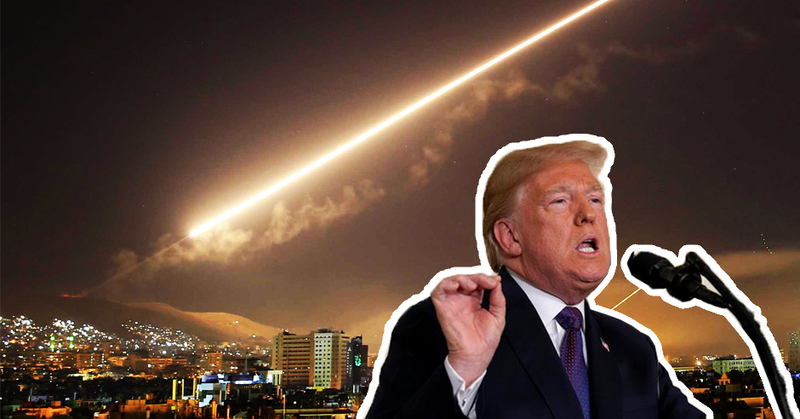 These actions are a deliberate US provocation against the Russian government which has indicated it will respond to any airstrikes with counter-strikes aimed at the launch sites. The US/UK/French decision to launch these airstrikes is a recipe for a world war, which could include nuclear weapons. We call on the peace movement, the labour and democratic movements, and on all peace-loving peoples to demand that the US, UK and France immediately end their war of aggression, and withdraw their weapons, troops and ships from the region, so that negotiations leading to peace in Syria can take place. Mass public opposition in the streets is decisive to stop the drive to war on Syria. We call on Canadian Parliamentarians to urgently speak up for peace and against the illegal war and war crimes launched by the US, UK and France against Syria. Canada must not be complicit in war crimes, and must speak out against US aggression that could ‘totally destroy’ Syria and the Middle East, or escalate into a global confrontation involving Russia and the US, in the name of the specious doctrine of ‘responsibility to protect’.